Oh, I just love to say it: WE GOT WORMS ! And you bet we got a lot of ’em! Around 3,000, and of course we named each and every one of them. Nah, not true, we didn’t name them. We are bad with names so we didn’t bother. I am talking about our worm bin – in the kitchen! All they do is to linger in there and eat, poop, and multiply. What a life ! What is this worm bin and doesn’t it smell bad? A worm bin is a so-called vermicomposting system: A composting system using worms to turn organic waste into fertilizer. It’s literally a bin with composting worms inside LOL . You put your kitchen scraps and some paper into the bin and the worms will help to make compost out of these things. However, both hubby and I are, um, not the most talented people when it comes to taking care of plants… So we will give the worm castings (= the fertilizer) to Vany, who has an allotment garden AND a green thumb, and who by the way wrote this cool guest post on using chestnuts as laundry detergent on my blog. A teeny tiny worm baby ❤️! Why would you want to compost in your apartment? Not every city offers curb-side collection of organic waste. So most of the time organic waste ends up in the general trash, lowering the caloric value of the waste if incinerated. Being able to compost right where you live means your organic waste doesn’t go to waste and neither does it need to be transported, which means this will not add to its carbon footprint. Also, you get to use the compost to fertilize your live plants. Well, if you are anything like us, you wouldn’t fertilize your live plants either way… Give the worm castings to a friend or post it in a local group on Facebook. So what can I feed the worms with? I like to say that the worms are raw vegans, only making exceptions for tea and coffee (grounds) . No animal producs like bones, meat, or dairy (they do love egg shells though), and no leftovers if cooked, oily or salted. These things tend to spoil very quickly and this would destroy the climate in the bin the worms need to survive. Banana peels also rot pretty quickly and should only put in in moderation. Worm also dislike citrus fruits, onions, and garlic; these strong smells just make them want to move house, so definitely don’t put too much of these bad boys in . To round it off, don’t forget to mix in some paper and/or cardboard to ensure your roomies get a balanced diet. Let me let you in on a little secret… We do put banana peels (never add non-organic banana peel because the pesticides can kill off an entire worm bin! ), citrus fruits, onions, garlic and sometimes even a scoop of cooked leftovers (which is super dooper uber rare in our home) into our worm bin, because a up-and-running worm population can handle a bit of this and that now and then, and it really is quite the exception in our case. In fact, we now have such a thriving worm community that they process more than we can feed them! When I told the vegan Café we frequent about it they started giving me coffee grounds because they were afraid my poor worm friends would have to starve to death. The worms did appreciate the coffee grounds (they LOVE coffee grounds!) but as a matter of fact, the worm population will adjust to the bin environment and at some point the population growth will stop and stay constant. Right now we have two hankies in our worm bin. We got our hands on some old hankies, but some of them had quite some nasty blood stains on them, so we decided to compost them . You can compost cotton, linen, lufahs as well as the handles of bamboo toothbrushes (and sometimes even the bristles, but that depends on the manufacturer really). Egg shells are supposed to be really good for the worm bin, but of course, as vegans, we don’t have any for our little wigglers . But on the other hand pretty much all of our kitchen waste can go into the bin, so that’s still cool . Whatever still has life in it cannot be composted. We have had avocado and pumpkin seeds sprouting out of our worm bin. If you want to grow these, awesome. If you don’t, just chop them up before you put them into the bin. Bird droppings and your pet gnawer’s poop, but keep dog and cat poop out of your worm bin! Click here for even more compostables. Do not compost bioplastics. They take YEARS to break down even in a hot composting system. You might consider burying it in your yard though if you happen to have one. Glossy paper like magazines should also go into paper recycling, not your composting system. Vertical worm bins are usually made from plastic and sold as “worm factories”. They are very good for beginners because there is a drainage system so it is easier to regulate the moisture level. Usually the bottom tier collects the worm tea and there is a spigot for you to harvest the worm tea. 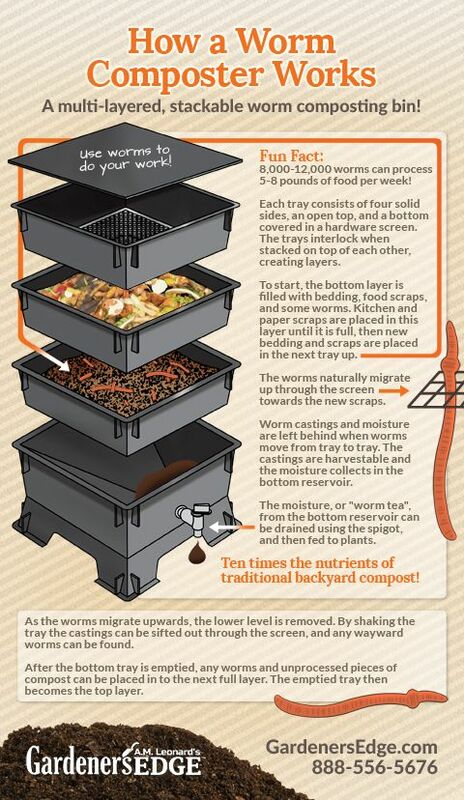 The vertical migration worm bin consists of different trays stack on top of each other. The bottom part of the tray consists of a mesh screen, so the worms can move from one tray to another. You start out by filling the bottom tray with your scraps until it’s full. Then you add another tray on top of it and start filling up that tray. The worms eventually move up to the next tray because there is more food. After a while, the tray at the very bottom only contains compost, also called worm castings, and can be harvested. You can see an infographic of how this works here. This is what we went for. Horizontal worm bins are usually made from wood and are pretty much a chest with a grid in the middle. It is said to be for the more advanced worm farmer, since you have to monitor your bin more closely so it doesn’t get too wet or too dry. The wood helps to regulate the moisture in the bin and lets everything breathe though. You fill your kitchen scraps + paper/cardboard in one side, until it is full after maybe 1 1/2 years. Yep, I’m serious. It takes about 1.5 years to fill half a worm bin. That’s because a big bucket full of kitchen scraps will shrink into only a handful of worm castings. Once you have filled one side, you switch to the other side. The worms will migrate to where the food is, so after the first side has been completely processed, they will move to the new side where the food is. After another 3-4 months the first side will be dried up and all you have to do is to scoop up the worm castings without having to pick out any worms like with a vertical worm bin. However, after 5-6 years the wooden worm bin will have to be replaced since the wood, of course, will slowly be eaten up by the worms . Click here for more info on horizontal worm bins. Oh right, you have a bin, but of course you still need worms to populate it. It is actually possible to go to a park or a forest on a rainy day to collect some worms. However, please don’t go for the common earthworm. The common earth worm is pale and pretty long, and isn’t a very good composter. It also lives deeper in the ground, so it isn’t suitable to be kept in a box. Go for the worms that look like the common earthworm, but are red and smaller. Worms that are red are usually pretty decent composters. The most common compost worm is the red wiggler, which actually is a name for two kinds of composting worms. We have both kinds of red wigglers in our worm bins by the way. They have really charming latin names like Eisenia andrei and Eisenia foetida. We also have European Nightcrawlers, called Dendrobaena veneta or Eisenia hortensis. There are also Lumbricus rubellus, the Read Earthworms, living in our bin. If you live in a warm and humid area, you might want to go for the African Nightcrawlers or Blue Worms instead, since the other species will die when exposed to temperatures over 86ºF/30ºC for too long. It is often advised to get a worm mix when starting a worm bin. After a while the worm species most suitable to the environment in your bin will come out on top. We have had our worm bin set up and running for over a year now, and I can still find all species in the bin (at least that is what I assume, since the two kinds of Red Wigglers are hard to tell apart, and so are the Red Earthworm and European Nightcrawler, even though I do believe I can tell the two latter apart). So seems like so far they don’t mind sharing the food? So where can I get my hands on WOOOOORMS?? Well, like I said, you can go and collect worms outside. Or you can ask around if somebody has a compost pile in their yard or sniff out an urban gardening project in your city. Because – tadaaa – if there’s a compost pile, there will be compost worms you can dig up. If you live in the middle of nowhere and there is a ranch or a farm with horses, ask them for horse manure. Composting worms LOVE horse manure. And if you are especially lucky you might even know somebody with a worm bin willing to share some worm love with you. Ooooor you can order them online. No kidding. The most common way people get worms is from online shopping LOL! Well, the non-parasitic kind at least . Not zero waste, but usually you can ask them to cut down on packaging and to send the worms as plastic-free as possible. Prior to setting up your worm bin you should prepare by collecting some food scraps. Keep them in your fridge or even freezer. Just make sure they are room temperature before you put them into the bin. You don’t want to freeze your worms to death now do you? Shred some paper and briefly soak them in water. When I set up our worm bin, I put the dry paper into the bin and then sprayed the paper. I don’t remember where I read this, but it didn’t work out well. Go for the soaking method instead, trust me. Now let the worms move in. Some soil or whatever they came with will add the necessary microorganisms. Mine came in horse manure, yum. Worm like it moist and dark. You can spray your bin from time to time to not get it too wet. If your bin gets too wet, mix in some paper or cardboard. If you have a vertical system, just drain the bin by opening the spigot. The liquid that comes out is called “worm tea” and is an excellent fertilizer. When putting in your scraps you should slightly bury it to prevent flies from laying eggs. You should also add paper regularly and always cover everything with a towel or newspaper to keep the moisture in. From time to time your worm bin will need a handful of egg shells and some mineral rock dust. The worms usually get the minerals they need from the ground, but since they live in a bin you will have to supply these minerals, or you will find your worm population suddenly disappearing after around three years, because they simply lack the nutrients they need to multiply. So these are the basics. You can go crazy over vermicomposting, but in my humble opinion this is enough to let you set up a bin and keep it running and your worms healthy and happy. Do keep in mind though, that a small worm population is more prone to mistakes than a stable large population, which is why I would advise to start with a big population. However, if you are careful, you can also start with a small population, and with good care and a bit of patience you will have a thriving worm bin in a couple of months. Less is more when it comes to feeding. One worm weighs less than 1 gram, which is less than 0.035 ounzes! We started with 500 worms, so even though 500 worms sounds like a lot, it’s not even a pound of worms. Each worm can eat up to half its own body weight each day. So if you start out with 500 worms, only feed them half a pound of kitchen waste a day at most. It is a lot easier to kill your worm population by overfeeding then by underfeeding, because if you put in more than what they can process, it will start to go bad and this will tip off the balance of your bin. Always put in enough bedding (paper and cardboard), so oxygen can get to the food scraps. This will prevent foul odors, which are a sign of a disturbed worm bin balance. If something smells bad, find the culprit. Most of the times you only have to mix in a bit more paper/cardboard, but sometimes you will have to remove the culprit to keep a worm-friendly climate in your worm bin. Do remember to add mineral rock dust from time to time. We do this whenever we remember, so maybe once a month? Leave the worm bin alone when not putting in your kitchen scraps. Don’t check ever-so-often. Checking your bin once a week to add moisture or mix in some more bedding is more than enough. Your worms will appreciate the privacy and reward you by doing a great job, which in their case is eating and pooping a lot. Oh, and making lots of worm babies. What a life! too many banana peels, meat, dairy of leftovers being added (come on, you knew better, didn’t cha?) ➡️ remove the culprit and mix in some bedding. overfeeding, meaning you put in more than what your worms can process and the kitchen scraps you put in start to spoil ➡️ remove what you put in immediately. If the box has already turned foul or sour, all you can do is to save the worms, get rid of whatever is left in your worm bin, and set up a new worm bin. My worms are escaping from my bin! Worm usually only escape when they fear for their life. They like it dark and moist, and it’s usually pretty dry and bright outside, so why would they want to leave their bin? It’s too hot. This happened to us last summer when it was around 95ºF/35ºC for a couple of days. Considering the fact that worms will die when exposed to temperatures over 86ºF/30ºC for too long it does make sense that they tried to escape. However, it wasn’t a mass break out. I guess most worms were already too exhausted to escape. All we could do was to pick them up and to put them back into the bin. If you have a cool basement you could move the bin there or turn on the AC (which we don’t have). It’s too cold. As long as you keep your worm bin inside this probably won’t happen. However, if you keep your worm bin on the balcony you should wrap it in a blanket for a bit of insulation, but still, keep in mind that the adorable wigglers cannot tolerate temperatures below 58ºF/15ºC for very long. If you have a lot in your worm bin, they can migrate to the core where it’s warmer since composting as such does generate a bit of heat. But really, don’t let the poor things freeze to death. Having a big population and suddenly feeding too little over a long period of time (> 4 weeks). Obviously they will want to look for a new source of food. Putting in too many non-organic banana peels or conventional produce. The pesticides in there will kill the ecosystem in your worm bin. If your worms still can, they will try to escape the poison. Puttin in too many citrus fruits/onions/garlic. I said it before. Your wiggly friends do not like aggressive smells. They will try to flee when there’s more than what they can stand. Definitely check out Red Worm Composting, it’s a great website with all the answers on vermicomposting and really funny and cool articles as well, like “Can you compost human waste?” or “Will a red worm population double in three months?“, highly recommended, really! They also sell worms, but I mainly like to read the articles lol. You can of course keep your worm bin outside, but do make sure it is not exposed to direct sunlight, rain, and you also have to wrap it in a blanket if it gets too cold (which is why I keep it inside, because it’s just so much easier and more convenient to keep it inside ;)). I used to have it on my washing room but, which is inside the apartment next to the kitchen, and though it never smell there were lots of tiny flies that’s why I move it to the balcony. The flies are still there specially on warm and sunny days but at least they are not inside my home. Do you anything to get rid of flies or prevent to show up ? Thanks! All the best from Canada! Do you know https://plus2vers.fr website ? It’s a “social network” that helps you to easily start worm composting, by finding worms and advice near you for free ! The website is being translate in several language (it’s actually only in French). Hello! Thenk you for this article! I was wondering how is the draining system in the horizontal system you use? Before I came across your article, I knew nothing about vermicomposting. Thanks to this awesome and super detailed post, I walk away as a worm bin expert . I currently have a simple backyard compost but will be moving soon and wanted to give a worm bin a try. I felt scared about starting one because I didn’t want to accidentally kill the worms (and cry about it like I did when my tropical fish died.) Thank you Shia! I can’t wait to try this out!